The word Harappa sounds similar to the names given to divine figures in south India. Mallappa, Beerappa, Veerappa, for example. Archaeological evidence shows that the first city to be built across the world - Harappa - came up in the Indian subcontinent around 2850-2900 BC. The word Harappa sounds similar to the names given to divine figures in south India. Mallappa, Beerappa, Veerappa, for example. In Kannada and Telugu speaking regions, names ending with "Appa" are very popular among the Shudra and Dalit communities. Names like Mallappa and Beerappa are now names given to godheads that cattle rearing and agrarian communities believe in. Harappa, the city built on the banks of Indus, went to Pakistan post partition. Harappa represents the advancements made in the area of construction of houses, streets, tanks, canals and forts. This advancement had been achieved a full 1,500 years before Rig Veda was composed. The Indological and archaeological studies also established that this civilisation was built by Indo-Africans before the Aryan race even showed any signs of its existence in the Indian subcontinent. Contemporary Indian villages show that it is actually villages that lay the foundation for cities. All cities have villages around them. The tradition in the Indian subcontinent is to name villages and cities after people. For instance, my village is named Papaiah Pet. People from the older generation told us that a fisherman named Papaiah and my grandmother Lingamma, whose family name was Kancha and who was the widow of a shepherd, built the first thatched houses which went on to take the form of a village in which fishermen/women, shepherds, toddy tappers settled down. During the time of my parents, people started tilling the land in the village using buffaloes while they also continued with their traditional occupations. Over a period of time, a tribe named Lambada, whose main occupation was cattle rearing, also settled down in the village. By now, around 4,500 people had started living in the village. For the last 10-15 years, the village has been witnessing people migrate to urban areas. Similarly, the city of Harappa could have actually been a village to begin with and Harappa could well have been the man after whom it was named. Building the city of Harappa would have been impossible without several villages surrounding it. So, these villages would have existed in the region where the Indus Valley Civilisation was spread, well before the city of Harappa was built. Building a city is impossible unless there is an agrarian economy to sustain it. For instance, my house that was built during my childhood, was constructed without too many tools being used. Wood from the village was used to build the thatched house. Over time, I saw how many in the village trained to become carpenters and the exercise of building houses became sophisticated. The same applied to how mud walls of our houses gradually came down and were replaced by pucca houses with brick kilns coming up in no time. Studies of Harappa show that the urban civilisation back then was far more developed than the town of Narsampet from where I completed Class 10. 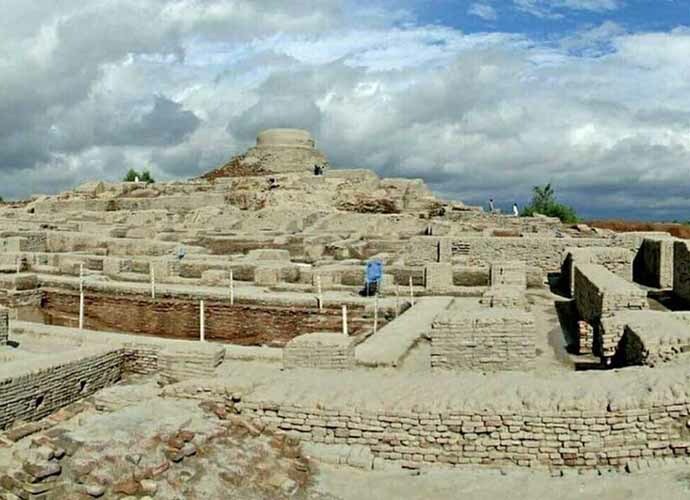 The Harappan city could have only been built under the socioeconomic conditions similar to the one that I saw in my village. The civilisation that started taking shape in Harappa soon spread to the cities of Mohenjodaro and Dholavira. While this civilisation spread along the river Indus, no such civilisation developed around the Ganga. We don't know if even villages exited in the Ganga region when cities were coming up in the Indus region. The answer to this question needs to be searched in what is known as Vedic economy. Vedic economy is actually pastoral economy. It involves animal husbandry: the care, tending and use of animals such as cattle, camels, goats, yaks, llamas, reindeers, horses and sheep. This in essence means that the Vedic economy and social life turned more backward after the Harappan civilisation declined. Urbanisation suffered a huge setback. Archaeological studies show that the Harappan civilisation was built by Indo-Africans, whose physical characteristics were more similar to south Indians, who are racially Dravidians (The Dravidian race is nothing but Indianised mixed race Indo-Africans). The Vedic civilisation, culture and linguistic society were built by Indo-Aryans, who apparently migrated from Middle East (mainly from the present day Iran). This civilisation is said to have thrived during 1500 to 1100 BC. Historically, this civilisation is also known as the one which followed the Harappan civilisation. The earliest and most authentic evidence of the Indo-Aryan civilisation comes from the Rig Veda, the first Brahminic scripture of India. A scripture that has roots of the caste structure within it. The scripture was written in Sanskrit, which even today continues to be hegemonised by Brahmins as temple priests. They alone read, recite and interpret all Sanskrit texts even in the 21st century. No Shudra has the right to do it. Many are still denied the right to study in Hindu schools and colleges. They cannot be priests in Hindu temples in almost the entire country. No Shudra philosopher has emerged from the Brahmin-dominated Hindu society. The philosophers to have emerged have only been Brahmins or Kshatriyas. After the Hindu fundamentalist outfit, Bharatiya Janata Party, came to power in 1999 and then in 2014, it started mass mobilisation of Shudras with the active involvement of the Rashtriya Swayamsevak Sangh (RSS). But no Shudra was empowered enough to become a priest in a Hindu temple. The BJP and RSS only reach out to Shudras for their votes, they are not interested in any real empowerment of the community. The Shudras have their historical roots in the Harappan civilisation. It is well known that there was no Brahmin, Brahminism or Sanskrit during Harappan civilisation. It is not known how the entire Indus Valley civilisation disappeared and how the whole civilisation was taken back to pastoralism by the early Aryans, which as I mentioned earlier failed to even build proper villages. A Rig Veda hymn shows how the scripture does not invoke God, but invokes Agni. In those times Agni could not have been seen as a source of energy used for cooking but could have been seen as the most powerful agent to harm the enemy by burning his/her resources - houses, cattle, crops, grain and other resources central to life. The other natural agent worshipped was Vayu (wind). In Rig Veda, Vayu and Agni have been accorded greater prominence than Brahma or Indira. When I was about three-four years old, a massive fire in my village destroyed most of the houses. The fire rose to scary heights fanned by the wind. Houses that were not in the direction of the wind, however, escaped harm. Villagers then started abusing Devudu (god of fire) and Vayu Devudu (god of wind) because the fire not only gutted houses, but also claimed a few lives. These, however, are among the forces of nature that have been eulogised in the Rig Veda. It is thus not surprising that the people who venerated destructive forces, created the caste system condemning a whole group of people into a life of ignominy. The author is political theorist and social activist.